LG and Philips launch Smart TV Alliance | What Hi-Fi? LG and TP Vision (which manufactures and sells Philips TVs) have joined forces to launch the Smart TV Alliance. Other Japanese TV manufacturers are "in the process of joining", the Alliance claims. The purpose of the Smart TV Alliance is to create a single, non-proprietary ecosystem for smart TV developers. Up until now, different TVs from different manufacturers have used different platforms and technologies. Bong-seok Kwon of LG Electronics, and president of the Smart TV Alliance, says: "Before today, the smart TV industry was a very difficult market for both TV manufacturers and developers as TVs from different brands used different platforms and technologies. "The Smart TV Alliance creates a larger playing field wich encourages developers to create more and better TV apps, while at the same time giving manufacturers and consumers the richest source of movies-on-demand, music services, games, social networking and more." Part of the Alliance's remit is to try and reduce the costs of developing apps for smart TVs. Alain Perrot, a Smart TV Alliance executive board member from TP Vision, adds: "Instead of spending valuable time on porting and testing on different platforms, developers can focus their creativity solely on realising apps that consumers will enjoy." Sharp has also given it support to the project: "We continue to believe this is the right direction for smart TV makers and app developers," it says. The big question is whether other TV companies will join LG, Sharp and Philips and support the initiative. To make it easy for them to join, the founding members have established the Smart TV Alliance Consortium to help define a set of standard technical specs for smart TV developers. This will enable them to create their apps once and run them on multiple TVs, regardless of the platform. 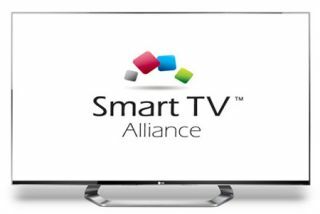 We're told the names of other companies joining the Smart TV Alliance "will be announced on the Alliance's website".